I was in San Francisco the weekend of August 10-12, for a contra dance weekend. It was also the weekend of Outside Lands, one of the biggest music festivals in San Francisco, about 70K per day (I think Hardly Strictly Bluegrass is a bit bigger). JUMP set up a temporary hub in Golden Gate Park and encouraged people to ride to the festival rather than driving. 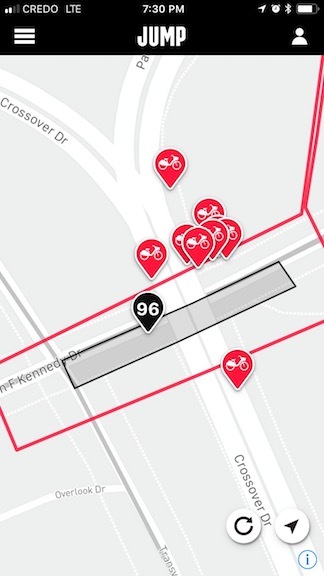 The screen capture at right shows the cluster of bikes there at one point in time, 96 in the geofence and others nearby. I saw the number 147 at one point, but did not capture that one. Since I did not go to Golden Gate Park (no person in their right mind would get close to Outside Lands if they were not attending), I don’t know what sort of parking they were using. Probably just lining the bikes up and using kick-stands, within a controlled and secure area, but this is a guess. I was unable to find any photos on the Internet. The ironic thing about this is that I was unable to find any JUMP bikes to use in the rest of the city during the day. Of course in the evening many of those bikes came back into the neighborhoods, but during the day, pretty much no bikes anywhere. The SF system only has 250 bikes, and availability is never 100%, so almost all JUMP bikes in the city were in one single location. Sacramento, of course, does not have any events of comparable size, so I’m not sure whether JUMP would ever do this here, but it is an intriguing thing. Ford GoBike did a similar parking offer in the park. Again, I was unable to find photos. GoBike is a dock system, requiring docks for the bikes, but in this case they may have just parked them without docks because it would be a major project to bring docks in, and remove them again. SF was not completely depopulated of GoBikes, though it was noticeable that there were fewer available. I used GoBike instead to get around, as my membership in GoBike has not expired yet. I got a membership way back when the system started, and renewed before JUMP showed up, though I doubt I will renew when it comes around.